Today the Club has a small core of active members and players, with a wider group of interested people who support special concerts and the Top Half Festivals. Like in most folk clubs in Australia the enthusiasts usually have grey hair, if any, and creaky knees. The number of young people involved is unfortunately small and needs to be increased for folk traditions to continue. The Club has an arrangement with the Darwin Railway Club which is located in Parap and is well known as the main “alternative” music venue in Darwin. Informal sessions are held every Sunday afternoon, with anyone welcome to come along and play, sing, yarn or just listen. 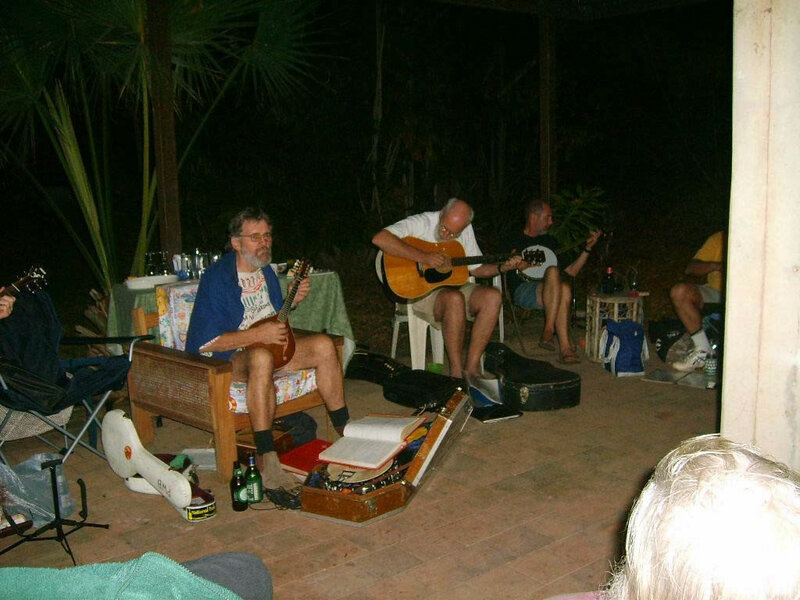 Every month the Club holds a House Concert at the home of a committee member or volunteer. The Club also runs special concerts for touring artists – generally at the Railway Club and usually on a non-profit basis. Club members still perform around Darwin, including at charity events, such as The Fettlers at the Adelaide River Railway Open Day. Given that the Club’s income stream has largely dried up, arranging the Top Half Festival every two years depends on the dedication of volunteer folkies.